I am not a woman of high-maintenance. I never had a facial and the last time I went to a spa was almost a year ago. Why? Well, It is not because I can't afford the service, it is just my nature not to care "a lot". Though I go to a salon for my yearly hair rebond, clean and color my own nails weekly, and regulary buy products for my skin and body, I still feel that I'm not doing enough to maintain my physical appearance. Believe me, I have four different kinds of creams in my cabinet, but I even miss applying them religiously. I guess, it is about time to change. Thanks goodness that Clarity is here! Clarity Aesthetic Medical and Dental Center offers a wide range of services in dermatology, dentistry, and plastic surgery. In partnership with John Robert Powers, they recently launched the Be Visible Campaign which urges everyone to step out and get noticed. 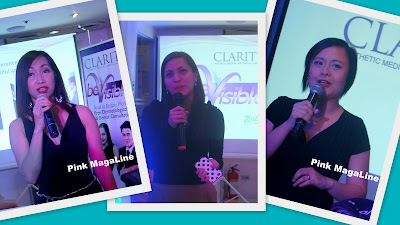 Some of the people behind Clarity: Ms. Carmie de Leon, Dr. Ma. Karen Lipana, and Ms. Maan Roxas - Tolentino. 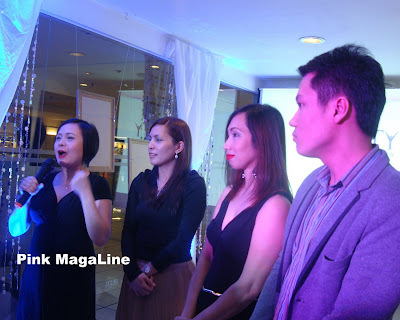 Health and beauty bloggers together with Ms. Carmi and the lovely host. Thanks to Gellesh for allowing me to use her photo. That's her in a purple outerwear (beside me in red).